Wouldn't it be wonderful to have all those classic cookie recipes - shortbreads, snickerdoodles, macaroons (and macarons! ), and more - in one place? It sure would be, and, now, it is, with Stacy Adimando's new cookbook, The Cookiepedia. With dozens of cookie recipes loaded with helpful tips, this book is a must-have for every cookie lover. We received a review copy of the book from publisher Quirk Books about a month ago, but found ourselves with little time on our hands until last weekend, when, at our five-year-old niece's request, we used the book to make a batch of chocolate chip cookies while Louie the Cat looked on. First of all, we love the cute cardboard-cut-out look of the cover, and the practical and convenient lie-flat binding. The recipe was straight-forward and easy-to-follow. The cookies had a wonderful molasses flavor that came from adding brown sugar as well as white sugar, and a deep, rich chocolate flavor from using bittersweet chips. They didn't come out looking like the beautiful picture in the book, that's true. We have baking issues, as you've probably read before. However, they tasted so good that we were inspired to browse the rest of the book. It is categorized by "type" of cookie (e.g. Chocolaty, Buttery, Fancy, etc. ), so you can easily find a recipe to suit your needs, wants, desires and/or cravings. Each and every recipe is accompanied by baking tips, helpful hints, fun anecdotes, cheer-inducing hand-drawn illustrations and even a place for baker's notes. Did we mention the gorgeous photographs that make you want to grab a cookie right from the pages and pour a glass of milk to go along with it? If you love cookies (and really, who doesn't? ), this book full of reinvented-from-the-classics cookie recipes ought to be your next cookbook purchase. We'll be mixing up a batch of the Molasses Spice Cookies this weekend...just in time for fall. Why don't you join us? 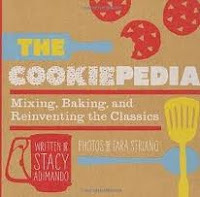 The Cookiepedia came out September 6th and can be purchased here, at Amazon.com. I haven't heard of this book before. Let us know when you can try some of the recipes. HA! I got this cookbook to review and posted my review today! Yours looks great! Lie-flat binding is so nice on cookbooks! It does sound like a good Xmas present. Cause who doesn't need a cookie encyclopedia? !